Note from the Editor: We told you earlier about Kwame, a ninteen-year-old male western lowland gorilla who came to Woodland Park Zoo from Smithsonian's National Zoo in Washington, D.C. just last month. That story picks up here in the words of Stephanie Payne-Jacobs, one of our dedicated gorilla keepers. She reminds us of why Kwame was chosen to be the new silverback for a group of our females and then takes us through their first days of forming a family. Our search for a new silverback, the adult male leader of a gorilla family, began just weeks after Leo’s passing in March 2018. While still processing the loss of sweet Leo, we knew we had to begin the search in order to bring a sense of normality back to the lives of the females Leo had left behind. 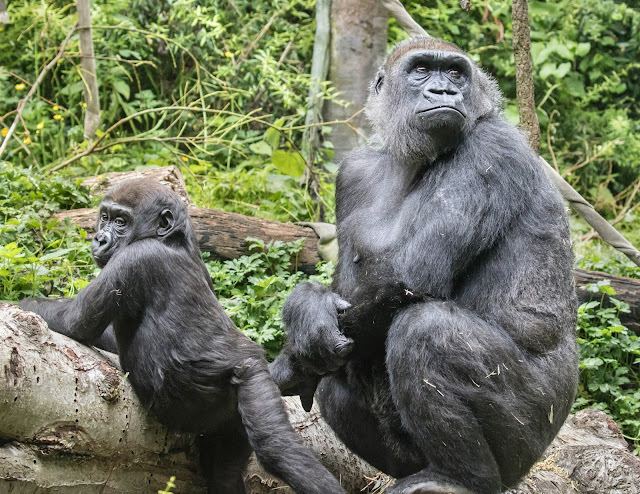 These females, 22-year-old Nadiri, 17-year-old Akenji, Uzumma, who is about to turn 11, and almost 3-year-old Yola, were faring well, but none of them had ever been without a silverback at the helm of their group. This was no simple search, however. With a youngster like Yola in the group, we had to be sure that the prospective silverbacks had the temperament and experience that would allow for the safe inclusion of an unrelated youngster. 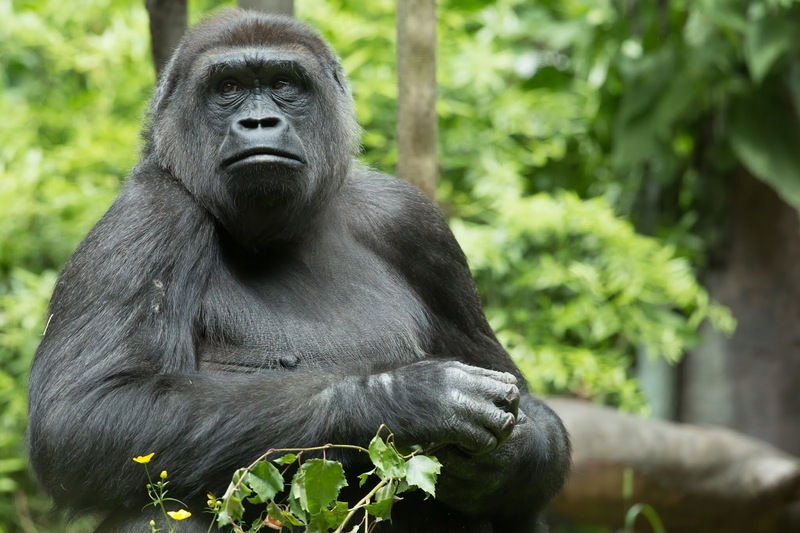 There were several males to choose from within the North American Species Survival Plan (a conservation program that spans across accredited zoos and aquariums), but one male seemed to stand out above the rest—Kwame. 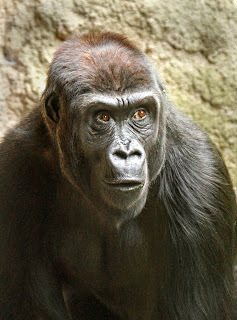 I first met Kwame while accompanying Woodland Park Zoo gorilla Calaya to National Zoo in 2015, and he seemed to be the perfect choice. At eighteen (he turns nineteen next month), he was past the young "silverback-who-needs-to-prove-something" years, and now had a disposition that displayed both tolerance and leadership. Kwame had been in an all-male group, living with his brother Kojo, for the last several years, and the two had a very typical brotherly relationship, with younger Kojo a bit more rambunctious, and elder Kwame acting as the restorer of order and calm. After numerous meetings and lengthy conversations, it was decided that Kwame would join his new family at Woodland Park Zoo. Kwame arrived to the zoo in the afternoon of September 6th after a pleasantly uneventful flight and transport to the zoo. 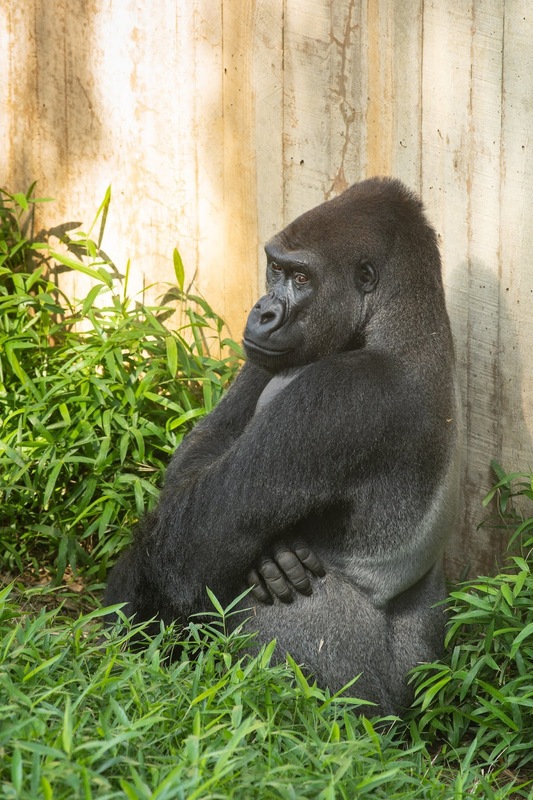 As his crate was shifted from the transport van to the behind-the-scenes gorilla exhibit bedrooms, he caught sight of one of the females in the outdoor yard, and he immediately seemed to understand what the point of all this traveling was. He sat down with his back against the crate and clapped his hands, as if to say “Let’s Go!” His life-long keeper who had accompanied him said she had never observed this hand-clapping behavior before. For their part, the females were also immediately smitten. Within an hour of his arrival, Kwame shifted into the bedrooms adjacent to his new family, females Nadiri, Akenji, Uzumma and Yola. As his door opened and he entered the area, you could tell that the females were simultaneously excited and relieved by his presence. Content grunts all around soon followed. The next afternoon, after Kwame had time to rest and acclimate to his new surroundings, we opened the strong see-through door exposing a mesh panel door between Kwame and the females. The very technical sounding term for this is a “Howdy” introduction. While all the females showed varying levels of interest, Uzumma made it very clear that she had strong, affiliative feelings for Kwame. Uzumma planted herself in front of his door and repeatedly tried to touch him through the mesh. Yola was the next to approach, and Nadiri and Akenji cycled through the room, occasionally stopping at the door. None of this surprised us, as Uzumma and Yola are the most confident of the foursome, Nadiri and Akenji a bit more cautious. After six days of the “howdy” introduction, and after Kwame was familiar with his new landscape, we proceeded with the next phase, the physical introduction. We decided to begin with Uzumma and Akenji, who had shown the highest level of interest (and bond with one another) around the mesh howdy door. We also had to gauge Kwame’s behavior before trusting him with little Yola. Kwame proved to be very appropriate in his behavior. He displayed and occasionally made contact with the females (and they with him), but never excessively, and he knew how to “read the room,” displaying without presenting himself in an aggressive way. A few days later, we felt confident adding Nadiri and Yola to the mix. By then, Nadiri and Yola were familiar with Kwame’s presence, and they had witnessed moments of excitement and calm in the physical intros with Uzumma and Akenji. As Nadiri and Yola entered the space, Kwame had to spend some time reestablishing his role in the group with some lively displays, but as everyone calmed down, the group seemed to gel rather quickly. Three-year-old Yola, as expected, was thrilled to be part of this new, dynamic group. Over the course of the next few days, she cautiously stayed within Kwame’s immediate vicinity, with her half-sister Uzumma stepping in to be sure she didn’t get too close. Kwame’s group is now fully integrated, spending days and evenings together. Kwame has exceeded his reputation as a wonderful, well-rounded individual. His arrival has bonded the females closer together, and he seems more than ready to be Yola’s new protector and playmate. The gorilla crew couldn’t be more pleased by how this group has received and accepted one another, and we look forward to witnessing this dynamic family group grow together along with you all. Kwame continues to acclimate to his new home and his new family, and the group is more cohesive each day. Our next step will be giving him time to acclimate to the outside yard. Please stay tuned for upcoming announcements as to when this family will be ready for your visit in the East exhibit. Love it! So glad Kwame has settled into his new home. Thanks for the update! I hate that these majestic animals can't grow old in their natural habitat (because of HUMANS! ), but this story is a positive one, and they're all safe from being murdered. Thank You for the update on kwame and his introduction into his new troupe. Things could not have turned out better, for all, even us humans who sometimes do not understand change until we see its positive outcome. Best Wish's for the future and baby gorilla's, fingers crossed. Congrats.... So happy to read Kwame has his own family now. He is going to be the perfect protector of all his gals. Great news, thanks for sharing! What is it like to intern at Woodland Park Zoo?